Liberal lawmakers as of late have had a knack of running away from questions they don't like. Sen. Bernie Sanders (I-VT) even pretended to be on the phone when the Daily Caller asked him to respond to the sexual assault allegations against Virginia Lt. Gov. Justin Fairfax. "Israel is an ally of the United States and I think as much as you would look to your neighbor, to your friends, to live out the same values as you are, we want to make sure that our allies are living out the same values that we push for here," she said. It was the second question she really didn't like. "Why do you support BDS?" Raju asked Omar, before she briskly walked away. BDS, short for the Boycott, Divestment and Sanctions movement, encourages companies to boycott Israeli goods and services. Sen. Marco Rubio (R-FL) has introduced legislation to punish companies who support the campaign. Omar was asked a similar question earlier on Tuesday at a Center for American Progress event. Again, her answer was underwhelming and vague. But at least she didn't flee. 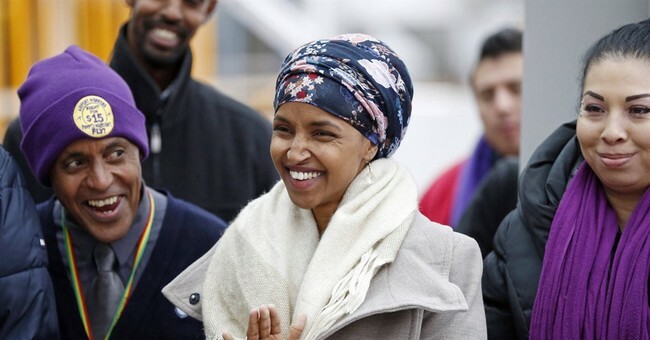 In previous CNN interviews, Omar has similarly struggled to explain her past musings about Israel, in particular that day in 2012 when she tweeted that Israel has "hypnotized the world." Asked about it, she made the situation worse for herself by admitting she fails to see how her comments were offensive to Jewish Americans.